Internationally renowned fashion designer Julien Macdonald has dressed some of the worlds most glamourous women - Beyonce, Nicole Sherzinger, Paris Hilton and Shakira are amongst his Celebrity clientele. Juliens signature look is high octane glamour with luxurious embellishments – a look which he has brought from runway to hallway with this stunning new collection Glitterati. Glitterati is our third wallpaper collection with Julien, effortlessly glamorous yet perfect for use all around the room, his attention to detail and creative spirit are captured perfectly within this design set along with Julien’s signature sparkle. Inspired by this season’s hottest trend, this striking tropical leaf design is reminiscent of Julien’s coveted catwalk creations. 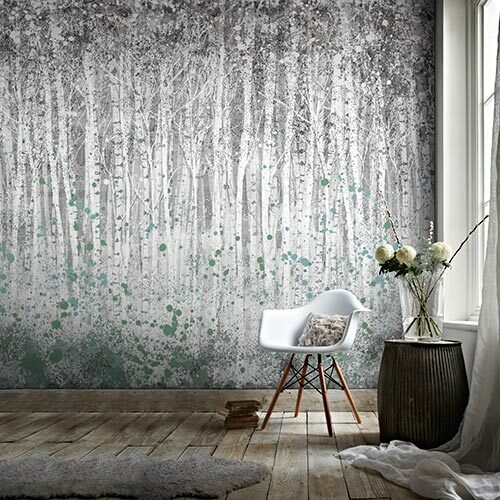 The stunning line-drawn foliage features metallic detailing and modern holographic effects, adding glamour to its elegant and stylish design. 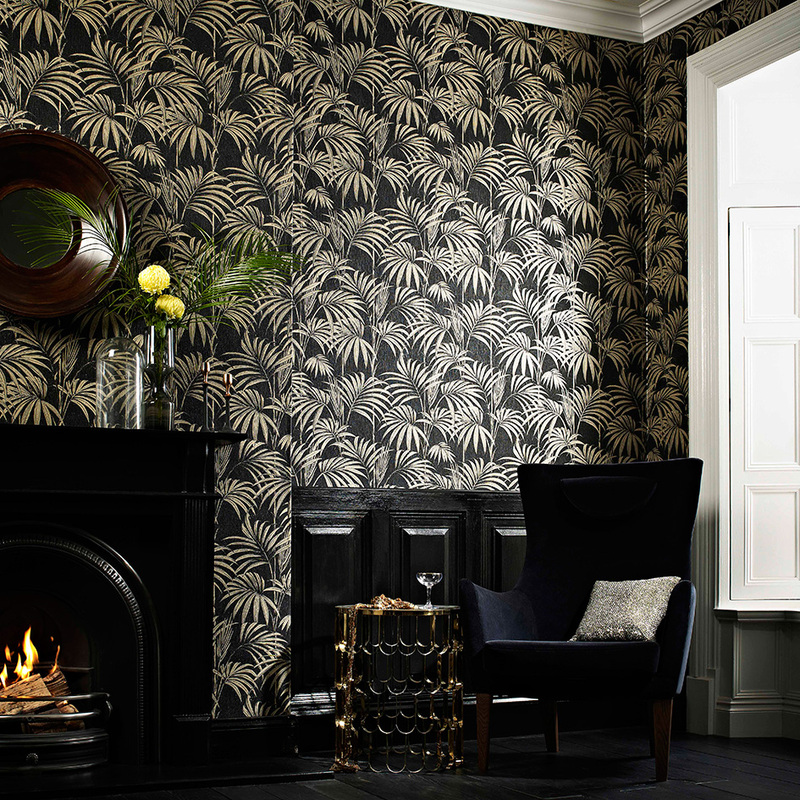 For a Damask with a difference it has to be La Palma, inspired by a tropical palm tree it’s a classic with a twist. 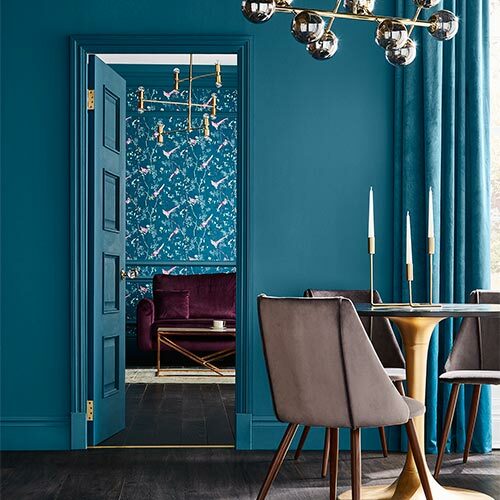 A glittering background and a gilded effect in a range of on trend catwalk colours, this design will give your walls some sparkle. 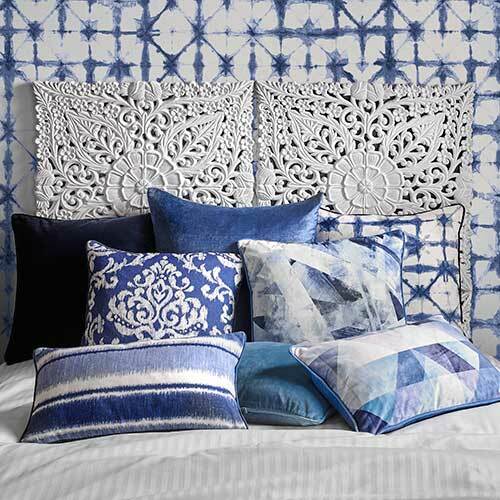 Julien’s oriental inspired floral design, is reminiscent of the delicate Japanese Kimono Silks. 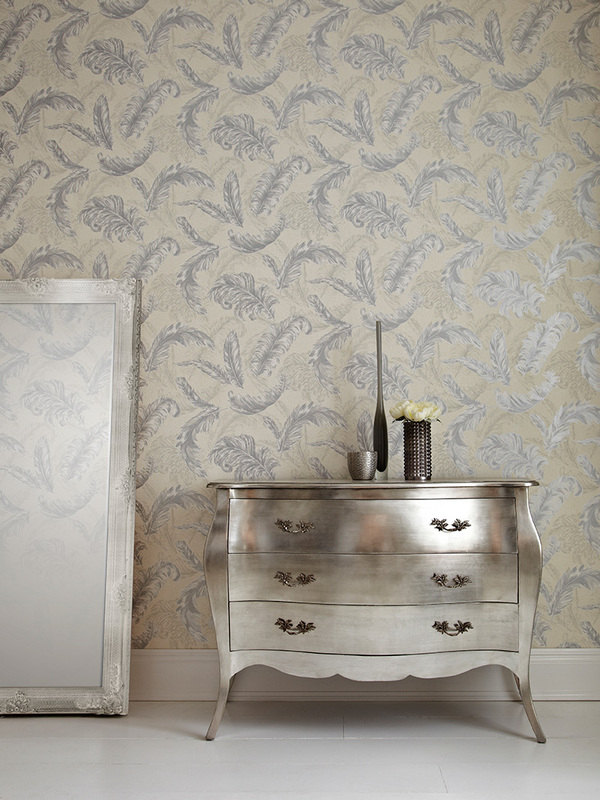 With its glittering birds and richly coloured floral designs, this luxurious, metallic embellished wallpaper, brings an uplifting feeling of the exotic to any room. This feminine grand damask, is a breath taking design set on a delicate glitter background. These beautiful feathers are reminiscent of those seen in Parisian burlesque shows. 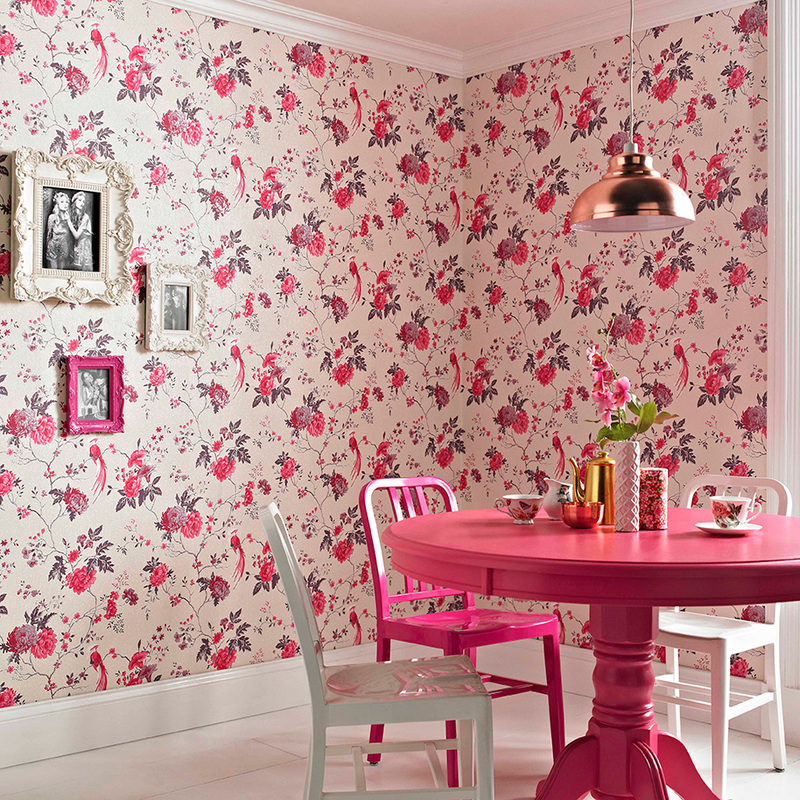 This classic design sits on a sorbet colour palette and is perfect for more than one wall. Julien provides his own glamorous touch with this fabulous contrasting design. As your room’s dazzling glitterball, this coordinating stripe will give the rooms of your home that extra sense of sparkle. Inspired by feathers and fringing used on many of Julien’s catwalk gowns, this stunning creation is haute couture for walls. 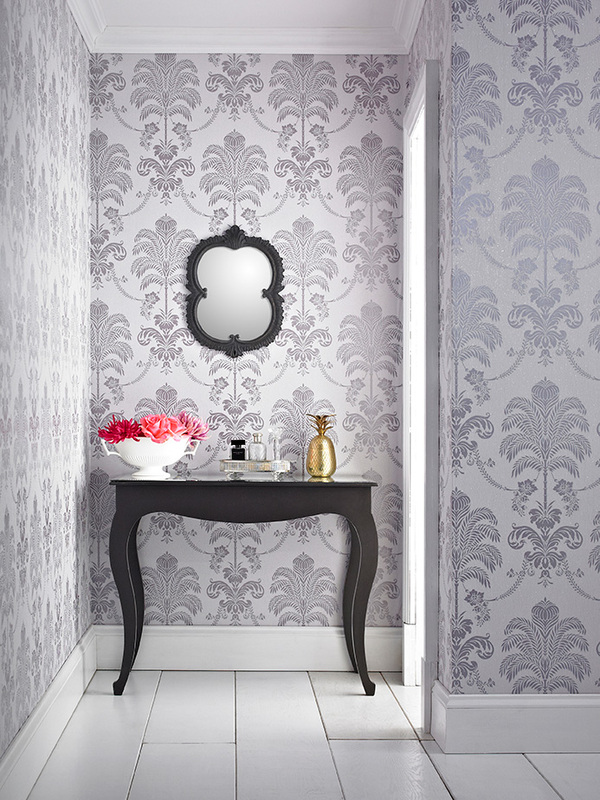 This beautiful wallcovering has all the hallmarks of a Julien MacDonald creation: an enduring design that is meticulous in detail, and eternal in style. 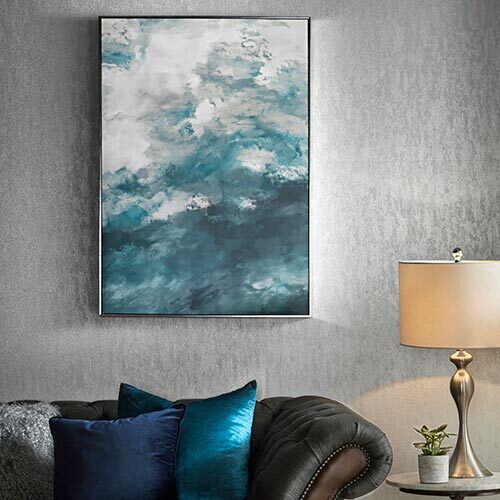 With its softly flowing trail and gleaming finish Venus is a twist on a leaf trail design with a feeling of space that is perfect for all 4 walls. The glittering background adds a feeling of real decadence to this stunning design.